For 28 years, Claudia Castellanos has worked alongside her husband, Pastor Cesar Castellanos, in the ministry. This is where she discovered that there was indeed a place for women in the ministry, without feeling intimidated by her husband’s ministry. The truths found in these pages will remove the blinders that have limited your understanding for so long. 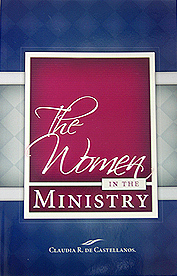 Every woman will understand God’s strategy and take her rightful place in God’s divine plan: the ministry. Pastor Claudia Castellanos is a woman who dared to believe that seeing in possessing. The Lord has used her to lift up an army of women. In Bogota, Colombia, she leads one of the world’s largest networks of women.